Archtor, a startup created by a team of City students, have held a retro gaming night at City to promote their innovative customisable keyboard. The Protean Reactive Gaming Keyboard allows users to change the display of the keys, controlled through a small digital screen embedded in each keycap. The versatile keyboard can be used in any language, any layout and with any software or game. City student and co-founder of Archtor, Miodrag Vidakovic is currently studying for a PhD in Sensors and Instrumentation, Optical Sensors and already holds a Masters in Telecommunications and Networks from City. He and a friend came up with the idea after finding existing keyboards frustratingly limited. Alongside Miodrag, the Archtor team includes City students Marius Braun, Michael Enger, Mustafa Fadel and an external team member Dean Prosenica. Gamers and game developers flocked to the ‘Archotorians Go Retro’ event, to play their favourite childhood games on classic consoles. Gamers could choose from vintage consoles including Nintendo 64, SNES, PlayStation 2, Game Cube and Dreamcast. They also had the chance to test the new gaming keyboard with Failure and Dota2, two games that had been specially integrated to work with Protean. 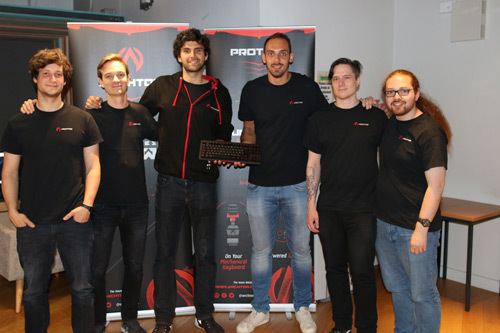 The aim of the event, Miodrag said, was to bring gamers and developers from across the UK together to enjoy retro games and be the first to get their hands on the latest prototype of the Protean keyboard. Winning CitySpark also gave us an excellent opportunity to network with people from the startup community and receive essential feedback. The team are launching a campaign on Kickstarter in September to raise further funding to get the project off the ground. They plan to use any funds raised to complete research and development and begin mass production.